There is a fruit named "Richardella dulcisica," better known as the "taste berry." When eaten, it causes the taste buds to experience food, even distasteful food, as sweet and delicious. 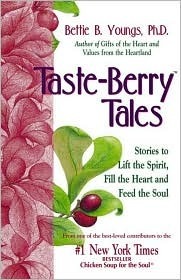 In "Taste-Berry Tales," Bettie Youngs, Ph.D., will inspire you with stories of real-life "taste berries"--people who have made a difference in the lives of others--and, by their example, show that we can use the events of daily life to improve the world we live in and the lives of those with whom we share it. As she reminds us, "It is our obligation and responsibility, as much as it is our honor, to help others on a daily basis to see their lives in the most positive light."